All Hail the Conquering Heros! The Battle of Leipzig in 1813 was the turning point in an united Europe's eventual defeat of French Emperor Napoleon Bonaparte. In fact, it was the first battle he ever lost! 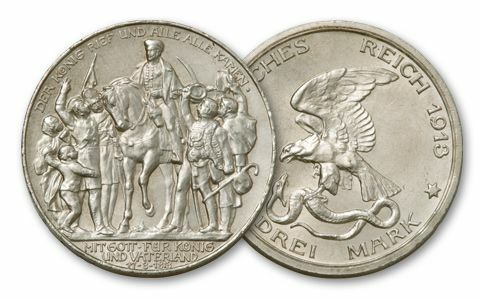 This 1913 Three Mark Silver from Prussia commemorates the 100th anniversary of the battle (this year is actually the 200th anniversary). 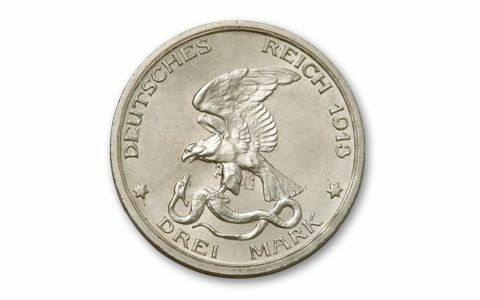 It shows an intricate design of the conquering heroes on the reverse, and the Prussian eagle on the obverse. We found a small hoard assembled in Germany. Each coin is struck in 90% silver, and is in Fine (F) collector condition. 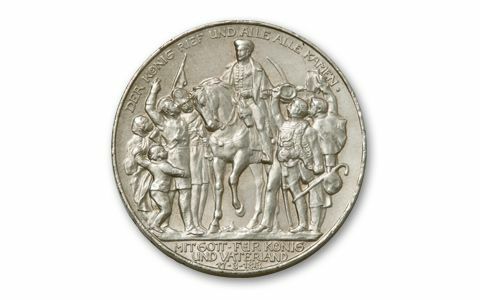 Struck by Prussian Kaiser Wilhelm, this special commemorative is one of the last coins minted by Prussia before all its coins were struck under the German Empire. Hurry to order this unique and historic coin!